Joseph finished his Th.M. at Covenant Seminary in 1989. He has been teaching at Daystar University since 1995 in the Religious Studies Dept. 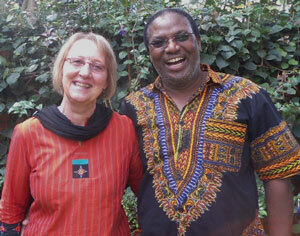 In 1997 the Lord led Joseph and Elfi to start a church plant in the community where they live in Nairobi. This racial reconciliation church ministers to Kenyan Asians and Africans. Joseph and Elfi form relationships with Hindus primarily through monthly "satsangs" or fellowships and quarterly evening "grills" for men, in order to reach just men. They have been blessed to see the growth of the Church from a humble fifteen people in attendance to the current seventy to ninety. The church is affiliated with a ministry to orphaned children in the slum area of Kibera in Nairobi and also ministers to handicapped people.